Limits on content as other “A” level events- WSF Footwork sequence. For 2017-2018, the WSF Footwork sequence is straight line down the long axis. Elementary International and International Solo Free Dance- These events must comply with the WSF solo free dance requirements. 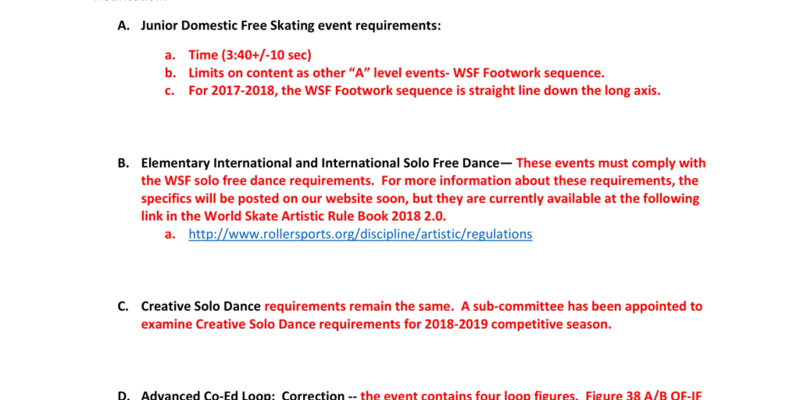 For more information about these requirements, the specifics will be posted on our website soon, but they are currently available at the following link in the World Skate Artistic Rule Book 2018.2.0. Creative Solo Dance requirements remain the same. A sub-committee has been appointed to examine Creative Solo Dance requirements for 2018-2019 competitive season. Advanced C0-Ed Loop: Correction — the event contains four loop figures. Figure 38 A/B OF-IF Paragraph Loop was omitted in error.